Thank goodness for this Instant Pot beef stew recipe! After starting a Keto diet, I was missing my favorite comfort foods. Typically, beef stew consists of lots of carbs, which isn’t something you want to indulge in when trying to maintain ketosis. Thankfully, this beef stew allows me to indulge without feeling any guilt! A traditional beef stew, with fall-apart tender beef, vegetables, and rich broth, is almost impossible to pull off on a weeknight. It can take two to three hours of slow simmering for the tough cubes of stew meat to begin to soften, and for the flavors to develop in the broth. That’s fine if you’ve got the time, but this Instant Pot beef stew recipe takes stew from a special-occasion weekend dinner to totally doable on a weeknight. Instant Pot is a brand name, but you can use any electric pressure cooker to make this recipe. Start by browning your meat right in the pressure cooker, then add chopped aromatic vegetables, broth, and spices, secure the lid and set the cook time for 35 minutes. You don’t even have to watch the pot while it cooks. When time is up, release the pressure valve and enjoy! WANT TO LEARN MORE ABOUT FOLLOWING A KETO LIFESTYLE? JOIN OUR FREE COMMUNITY FOR MOMS, AND BE INSPIRED AND ENCOURAGED ALONG THE WAY! This Instant Pot Beef Stew recipe makes a richly flavored, hearty stew in less than half the time of a traditional recipe. Turn Instant Pot to sauté. Add oil and beef; cook, stirring frequently, for 5 to 6 minutes, or until beef starts to brown. Add flour; cook, stirring frequently, for 1 minute. Add onion, celery, carrots, bay leaves, salt, pepper, and broth to Instant Pot. Cover and seal Instant Pot; cook, on stew/meat setting, for 35 minutes. Release pressure to vent immediately. Let sit for 10 minutes. Remove lid and discard bay leaves. You may also like this Instant Pot Keto Meatballs recipe! JOIN OUR FREE COMMUNITY FOR MOMS WHO WANT TO LEARN TO FOLLOW A KETO LIFESTYLE! I don’t have an Instant Pot but I would love to try this recipe in my slow-cooker. I just received one of these pots so am in need of new recipes to use it. This works perfectly. Yum! My husband and I have been doing keto and are always looking for new recipes to try. This looks delicious! I don’t use my instant pot nearly as often as I should! This sounds so hearty and delicious. Must give this a go – perfect for a lazy rainy day. This one of the best recipes. I love stew. I can’t wait to make this one as it is good for you. I don’t have an instant pot (yet) but I am considering throwing these ingredients into my crockpot and still enjoying this amazing savory classic! I am probably more happy for this recipe than I should be 🙂 I just got an Instant Pot, and have decided too enter the world of low carb/keto this year. So I am adding this recipe to the top of my list of meals to try. Thank you!! Every time I hear more about the instant pot and recipes that use it, the more I want one. You use flour in this recipe; is there an alternative that doesn’t require me to go buy something I would otherwise never use in any other recipe? Would almond flour or coconut flour be a good thickener as well? Yum! Looks delicious! 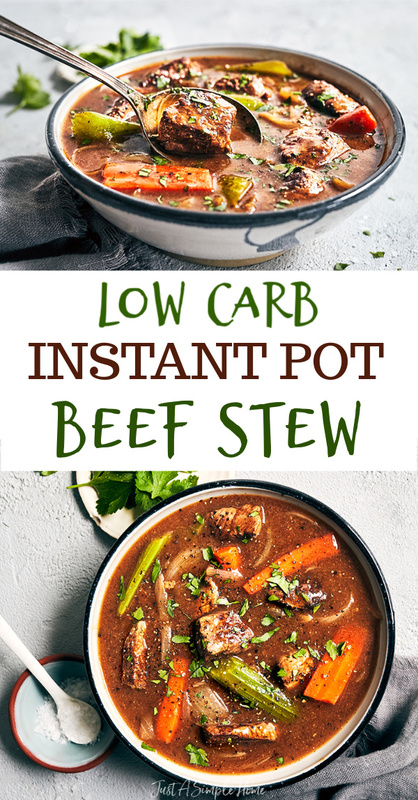 I’m always needing new ways to use my Instant Pot, and I’m trying to eat lower carb as well! it’s perfvect stew weather right now, so i needed this! I’m always looking for more instant pot recipes! This looks so good and perfect for these winter months! My instant pot recommends not adding flour or thickeners until cooking is complete. I’ll add some of my low carb baking mix at the end. Love simple and delicious meals like this! This meal would really hit the spot!